JOHN WALTON PRICE a MORMON SHOOTER and CLUBBER a pvt. 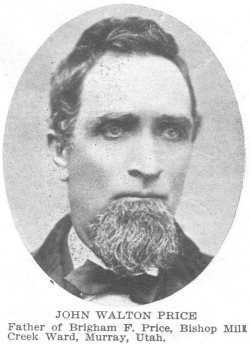 in the Iron County Militia; Father of Brigham F. Price; Bishop of the Mill Creek Ward, Murray, Utah. Born: 2 Feb 1834, Whitbourne, Herefordshire, England. Christened: 2 Mar 1834, Whitbourne, Herefordshire, England. Died: 11 Feb 1904, Salt Lake City, Salt Lake, Utah. Buried: 14 Feb 1904, Elysian Burial Gardens, Salt Lake City, Utah. Source: Church of Jesus Christ of Latter Day Saints , History Center.